The NDIS offers a number of opportunities for sole traders wishing to deliver a support or product. Whether you are new to the sector or experienced, going out alone can be a daunting task. In 2013, the National Disability Insurance Scheme (NDIS) started in Australia. The Scheme provides people with disability more choice and control over their funded supports. Entering into the NDIS means that people with disability can now choose which service providers they want to work with for their services. Participants in the NDIS will need to identify their service providers and sign an agreement with them. Service providers will need to have systems in place to support self-directed services and individualised funding arrangements. Read more about the journey to the NDIS. The National Disability Insurance Scheme (NDIS) was launched in trial sites on 1 July 2013. The Scheme is being progressively rolled out over the next few years across Australia. In each State or Territory, the roll out will be staged to ensure the transition is as smooth as possible. Everyone who needs the NDIS will have access by 2020. Read more about the roll-out. 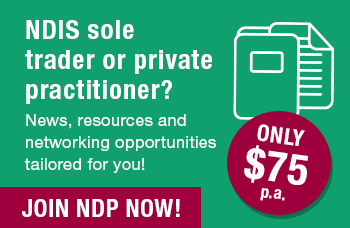 Sole traders can join NDP for just $75 per annum, providing access to information, a learning hub of resources, discounts on a range of goods and services, and connections with others practitioners and sole traders in the sector.